New Boston freshman Grady Jackson finished with nine points in the Tigers home win over Green Tuesday night. NEW BOSTON – Hot start, incredible defense, and closing out a game at the free throw line: that’s what the New Boston Tigers rode to a 73-63 home SOC I win over Green Tuesday night to improve to 15-4 overall, and 9-2 in conference play, taking over the lone second spot in the conference. What better sentiment to preach to your team going into a big game? And to no one’s surprise, as they have for the vast majority of the season, the Tigers responded well to their coach’s challenge. Green started the game off up 4-0, all four of which were scored by Gage Sampson, but things quickly changed from there. In a split second, the high flying, super speedy Tigers offense was out and running. New Boston used their momentum from forcing turnovers on the defensive end to hitting big shots on the offensive end to turn their four point deficit into a 12 point lead going into the second quarter, finishing the first on a 26-10 run. The biggest reason for that and why the Tigers were able to hold a double digit lead for more than three quarter were two players that didn’t lead the Tigers in scoring but contributed in more ways that just in the scoring column: freshmen Jerome McKinley and Grady Jackson. Fire and ice, peanut butter and jelly, thunder and lightning: whatever two adjectives you’d like to use to describe the play of Jackson and McKinley, it fits. Jackson and McKinley finished with a combined 24 points, 14 rebounds, nine assists, and nine steals. Yet despite those scary numbers for opponents to try and game plan against in the future, the young duo finished with a combined three turnovers. Three turnovers. If that isn’t impressive going against an upper-class led team in the Bobcats, it’s unclear what is. “Me and ‘Rome, we knew coming in as freshman and underclassmen, that we were going to have to step it up and play like upperclassmen and we did our best tonight,” said Jackson when speaking of his and McKinley’s play. New Boston held a double digit lead for much of the contest, except for two stretches: an insane run by Tanner Kimbler, who scored a team high 24 points, in which the sharpshooting senior scored Green’s first 15 points of the second half after scoring just five points in the first half, and the Bobcats run to close the game that ultimately fell short. This win likely gives New Boston a number one seed in the sectional brackets that will be released at week’s end. 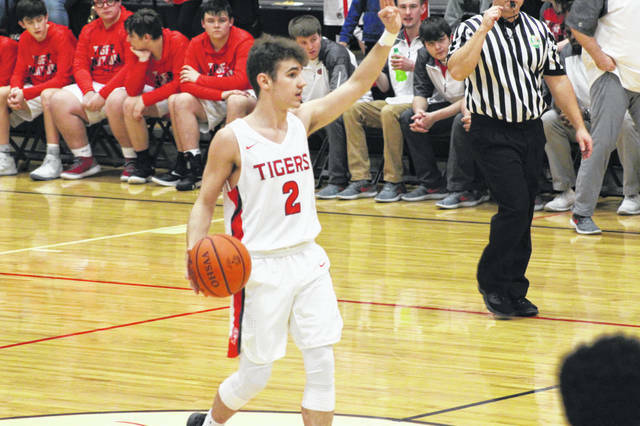 Going into Friday’s game with #10 Eastern (Division III), a rematch of the two’s game earlier this season which say the Eagles victorious in triple overtime, this win over county rival may give the Tigers the momentum they need to pull off a big home win over one of the state’s best.